Smart Shield manufactures world class High Temperature Insulation & Flame Retardant products which are built for the most extreme conditions where failure would be catastrophic. These products are state of the art in high temperature material engineering and are manufactured using Fiberglass / Silica / Ceramic as the base material. Most of our products operate with no problems in temperatures up to 3002°F (1650°C) providing energy savings and personnel protection. All our products provide can protect of hoses, lines, tubes, wires and cables from abrasion, moisture, chemicals and fungus. Our High Temperature Insulation Product s are available in the form of fabrics (cloth ) , sleeves, ropes (braided, twisted) and tapes / wrap (with / without adhesive). 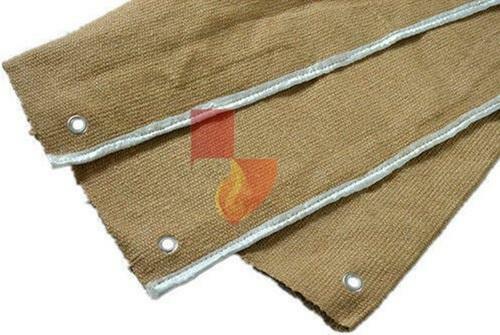 We also have expertise in manufacturing Pyro Jackets / Fire Sleeve (Silicone Coated Fiberglass) which are fire resistant. We also have expertise in manufacturing Sealing Rings & Gaskets which are made from Pure Flexible Graphite. Our Product Range also includes, Welding Blanket, Fire Blanket, Aluminized Aramid Gloves, Welding Tents and Protection Covers for Hydraulic Cylinders.